Welcome to the web pages for our Club. We are based in Devon, England (MD105SW). 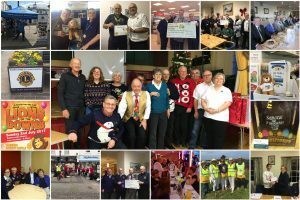 Babbacombe and St Marychurch Lions Club is made up of both men and women aged 18 and over who all share the common goal of serving the local community and supporting local causes and charities. However the club also supports national and international causes as well. The Club, formed in 1983 and has been serving the bay since. The club has several projects they focus on throughout the year which work with both the demands of the community and the meeting needs with in the tourist season. In addition to the above, other programs supported by Lions includes Message in A Bottle, Life Skills, Young Leaders in Service International Disaster Relief, Environmental Issues and Community Welfare. Please click here to request more information on these projects. Lions Clubs International is the largest service organisation in the world and has over 1.4 million members. This covers approx 46,000 clubs in over 200 countries. The lions of Babbacombe and St.Marychurch hosting the race night at Carlton Hotel Torquay. Tonight raised £110 for local charities. Thank you to all who played along. Someone has to check the money is right. Copyright © 2019 Babbacombe & St Mary Church Lions Club. All rights reserved.